to change the present system of power execution in our country. support please the Politethical Code. A new sub-area of the applied ethics proposed, the task being a definition of ethical standards applicable for all politicians in everyday public activity and expressing them in the formula of Politethical Code as well as, as a result of the above-mentioned, the analysis of the public activities and behaviour of the people of politics in confrontation with the legally adopted politethical standards. We are all witnessing the civilization changes on our globe. The globally scientific-technical infrastructure developing with a thunderbolt speed was not followed by a development of socio-political relations, which raises objection to the out-of-date form of directing the society, including ruling it. The task of the Code is to define necessary ethical standards, which should be respected by all politicians having any influence on the life of an ordinary citizen. Thanks to this Code, a new political elite may appear, expected by us all for so long. Executing the power is to be a citizen honour to direct the society and not a political burden to rule it! The Politethical Code may contribute to change the previous form of ruling and achieving a social supervision over it. I am honoured to present myself as the author of the project of Politethical Code on its initial developmental stage, which still requires a content-related specification, maybe some kind of correction, and certainly extending it with a part concerning sanctions for infringing the Politethical Code not existing yet and the procedure connected therewith, the establishment of which requires involvement of a number of professionalists. I hope that the Politethical Code commenced by me will touch all public opinion, having enough of politics in the previous form and politicians concerning their previous election choices, making the willing supporters of the topic cooperate over its further development. In the project of the Politethical Code, I used the thoughts included in the “Ethical Code Politics” published on 30.06.2013 by Professor Jan Hartman on his blog “Loose Blues”. As a philologist Romanist graduated from Adam Mickiewicz University in Poznań and a Germanist after a few terms of the University in Hannover as well as a graduate from the Postgraduate Museological Study at Jagiellonian University, I do not have a thorough philosophical or sociological knowledge or this of the law, however I am a careful observer of the socio-political life. Looking at its serious disadvantages, as an ordinary citizen I concluded that at last someone should start changing in an ordered manner the socio-political reality surrounding us, trying to correlate it with faster and faster technical-scientific development which does not generate automatically the changes in social relations necessary for the development, and even more in hermetic political connections. For our civilization development to live a measured rhythm, one should create permanent mechanisms of harmonious progress in all aspects, thus as well in the socio-political level. As the societies are ruled by politicians, a natural reflex is to direct our attention in the first place to them, so that they start perceiving a mission of serving the country to which they are appointed. The proposed Politethical Code should help them efficiently in it, namely the new legal act governing the ethical principles of conducting political activity. It would be the starting point for the appearance of the new type of the penal law in the legal area, i.e. penal-ethical law, in this case, covering with its scope the actions of politicians, namely a social group having the most important influence on the development of the intra-national relations. The well-being of the whole nation depends in fact on its activity. When in December last year I started the works over the project, the persons from my surroundings, were quite sceptical about the idea, to which I was devoted at that time. Now, after May presidential elections, when in the country the turbulence took place on the socio-political stage and the state may be even threatened with the phantom of progressing anarchy in socio-political life in the future, the project starts to be perceived by the persons who already know about it being established, as more real in its expression and even necessary in their opinion to normalize the socio-political reality surrounding us. Even if the future implementation of the project into our law system had to be connected with defined legislation changes, including the amendments to the RP Constitution, it would turn out to be a better alternative from the undesired effects of the unforeseeable now uncontrolled social protests with revolution-anarchistic nature, the initial symptoms of which can be observed by us around us now. It is more reasonable thus to take certain preventive actions in the democratic system as soon as possible, including socio-political one of the state, than to abandon necessary reforms, relying on unknown course of events. If you agree with the thesis, you will certainly support the project of the new type of the code proposed by me. Its idea is to serve the common reason. In this place I would like to thank kindly Ryszard Bałczyński for valuable guidelines and suggestions while developing the project in its initial stage. 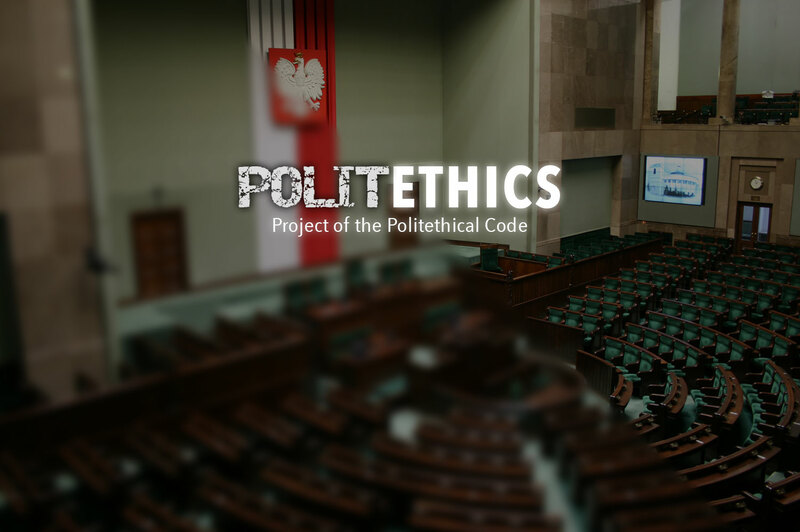 Special thanks for granting the project of the Politethical Code a professional image and preparing formal-legal correction to be passed to the lawyer from Warsaw who wanted to remain anonymous. The entire website presented, including the placed texts of Preamble, draft of the Politethical Code, a definition of the “Politethics” term and detailed justification of the Project constitutes a property of Przemysław Kroczyński and he is the author within the meaning of the act of 4th of February 1994 on copyrights and derivative rights (J. of L. of 2006, No. 90, it. 631 as amended). No part of the website may be used and disseminated or copied in any manner (electronic, mechanical or another) for other purpose than dissemination of the Project for its support. The usage and dissemination of any part of the website for the purpose indicated in the preceding sentence may take place exclusively with a note on copyrights with indicating the source of its origin.